When my Dad and I had my original Red Special guitar nearly finished, at a total cost of about eight pounds, I had designed and made three pickups for it. They were made out of things that we had been able to find, just like the rest of the guitar – in this case, three Eclipse button magnets surrounded by coils of wire wound on a special winder Dad had made and faced up with white Formica plates. The windings were terminated on the two brass bushes that held the fixing screws …the brass bolts that held the pickups into the body of the guitar. This meant that there were no loose wires hanging around – every time a pickup was screwed in, it was immediately in circuit. Well, the pickups sounded really good, nice and crisp, just like the experimental one I had put on my first acoustic guitar, and plugged it into my Dad’s radiogram! And all the ‘in and out of phase’ switching worked fine too – I took it into school to show my mates how the sound could be varied… this switching arrangement had never been used before. But there was one problem… when I bent a string, moving it sideways across the pickups, a strange rustling sound was heard – like a kind of scraping, as the string moved back and forth. I figured it was because in my pickups the field alternated North-South-North-South moving across the strings. Somehow this seemed to produce a kind of tearing of the magnetic lines of force. Or so I thought. There seemed to be two possible solutions, either cut up each button magnet into two and arrange all the North poles to be together pointing upwards – or try some other pickups. The first option was dificult… I had no way of cutting such hard steel. (I blunted a few saw blades trying!) So I went out in search of loose pickups. It so happened that I walked into the new Burns showroom in the base of the new tower in St Giles’s Circus – (very close to where our show We Will Rock You would find its home nearly 40 years later!) I can still see the rather fat man who sold me the pickups. In those days people who worked in music stores were usually pretty scornful of young lads like me who evidently didn’t have the money to buy their amps and guitars – and this man was no exception. The way I remember it, he had a bit of smirk as he took the money – a total of nine guineas, for the three pickups. As if to say, “Well obviously you’re wasting your money, because the guitar you’re making can’t be any good.” So suddenly my guitar had cost nearly twice as much in total! I took them home carefully in their paper wrappers. I had to put special posts in the guitar to anchor the wires, something I hadn’t wanted to do, and hadn’t needed to do with my own pickups, but this had the advantage that I could at least change the polarity of each one easily. They immediately sounded good. I had lost the really sparkling clear top, but the pickups had a warmth and ‘singing’ quality which I instantly took to. That was it. They became part of my guitar’s sound, and have been ever since. There was one more piece to the story… when I held the guitar near the speakers at high gain, they fed back in an unpleasant way – a high pitched whistling noise – because of a microphony in the body of the pickups. They fed back through this ‘microphone’, rather than purely through the string, which is of course a pleasant thing to happen, since it can produce a musical sustain, if things are set up right – exactly what I wanted from my guitar – I wanted it to ‘sing’. sound those original Burns jobs made. Now we have returned to Burns, since they have begun making them again… and very good they are too! All the new TBM guitars are fitted with the recreated “Tri-sonic” pickups, and they sing just right! The sound of a Tri-Sonic pickup is not like a standard single-coil pickup, or a double-coil (humbucker) – it is some way in between. It has more warmth than standard single coil pickups, so sings (feeds back) a little easier, but it also has more top end, or crispness, than a humbucker, and does not self-limit at high levels, because its inductance is smaller. We figure that the ‘fatness’ which we like so much comes from the fact that a Tri-Sonic seems to pick up vibrations from the string over a longer distance measured along the string than a normal single coil. Maybe this is because the casing is magnetic itself, and spreads the magnetic ield. Well, whatever the reason is, they just have that sound, which thanks partly perhaps to me, Vox AC 30 amps and various treble boosters, has become a sound that many guitarists enjoy having at their ingertips. The sound that makes chords keep their clarity, yet sound big, and makes single notes go into smooth distortion and sing like a bird. Burns Tri-Sonic Pickups do this!! GREG FRYER APPRAISAL FOR BURNS TRI-SONIC PICKUPS. 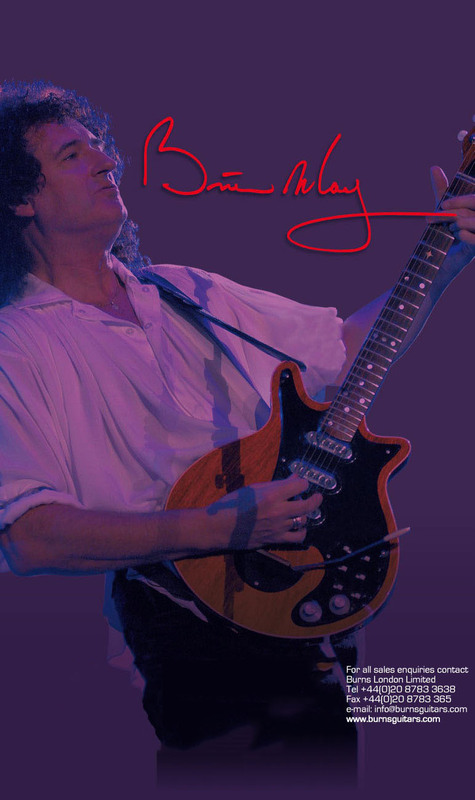 Greg Fryer has custom built Red Special guitars, pickups, effect pedals and amplifiers for Brian May and is currently co-ordinating development of several Brian May products. In 1998 Greg repaired and restored Brian's famous Red Special guitar and is the only person to have ever completely taken apart, examined and repaired the Red Special's original Burns Trisonic pickups.
" It has been an interesting exercise to examine the new Burns Brian May Trisonic pickups, and to compare their sound against the known quantities of my own Red Special replica guitar and other well known Red Special guitars. At first glance I was unsure what Burns' Korean pickup manufacturers would achieve with the notoriously difficult to make unconventional old pickup design that the vintage Trisonics are...what I have found inside the pickup has been very pleasantly surprising and I have also been impressed with their sound. The heart of the Burns "Brian May" Trisonic pickup is a bobbinless tapewound coil and a two piece vintage style isotropic magnet. The unconventional bobbinless coil is a challenge for any pickup manufacturer, and this coil is very neatly made. The two piece magnet tested at the upper gauss strength range of vintage 1960s Burns isotropic magnets, with these older style isotropic ferrite magnets giving a prettier more defined sound to the pickup than the harder flatter sounding high output anisotropic ferrite which is found in many modern pickups. The new pickups do indeed have pleasant defined trebles similar to many original 1960s Burns Trisonics that I have played, and produce a nice dynamic attack when played hard. They certainly seem a little punchier than some vintage Trisonics and this will probably appeal to many people. Overall I would definitely recommend the new Burns Brian May Trisonic pickups for people wanting a quality pickup to retro-fit to existing Brian May guitars, and very soon we will look forward to these same pickups being available as standard issue on the excellent Korean made Brian May Red Special guitars." ONLY BURNS MAKE GENUINE BURNS TRI-SONIC PICKUPS. ALL OTHERS ARE UNAUTHORISED FAKES AND NOT MADE TO THE CORRECT SPECIFICATION.